This article first appeared in The Edge Financial Daily, on January 14, 2016. INFINITI Motor Company had a record-breaking year in 2015 with global sales of 215,250 vehicles, up 16% from the previous year. Overall, Infiniti achieved all-time high results in all of its four global regions — the Americas (the United States, Canada, Mexico and Latin America); Europe, the Middle East and Africa; China; and Asia and Oceania — and in many individual markets. December 2015 was the best-ever month in Infiniti’s history with more than 23,100 vehicles sold, representing a 17% increase compared with December a year ago. Infiniti has now had 16 consecutive months of year-on-year growth. On an individual model level, the Q50 continues to be Infiniti’s top-selling vehicle. The 2015 volume of 78,800 sales (Q50 and Q50L combined) represents an increase of 44%, followed by the QX60 (54,800) and the QX80 (19,300). All of these models achieved records for a full year. The 2016 Infiniti Q50 sports sedan will also go on sale with a number of significant technical upgrades, including an all-new twin-turbo V6 engine that delivers up to 400 horsepower. The sports sedan features a comprehensive list of cutting-edge innovations. Infiniti is currently in the middle of a major product offensive. Last year, the company introduced its Q30 active compact to the public at the 2015 Frankfurt Motor Show. 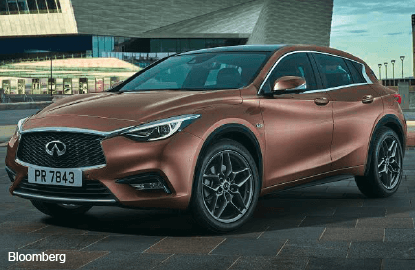 The Infiniti QX30 premium active crossover made its simultaneous global debut at both the Los Angeles and Guangzhou International Motor Shows in November. QX30 production will start in the first quarter of 2016. Both the Q30 and QX30 will play important roles in realising Infiniti’s plans for global growth. In addition, Infiniti has renewed its versatile QX60 premium crossover for 2016. It has introduced a wide range of changes and technologies that enhance the seven-seater’s exterior design and its driving dynamics as well as comfort, convenience and safety. At the 2016 Detroit Auto Show, on from now to Jan 24, the all new Infiniti Q60 is making its world premiere, expanding Infiniti’s product line-up further. The premium sports coupe combines expressive design with exhilarating performance and dynamics. The Q30 is Infiniti’s first offering ever in the premium compact segment; it is also the brand’s first vehicle to be manufactured in Europe. As part of its global growth plan, Infiniti is significantly expanding its manufacturing footprint. Infiniti vehicles are now built in Japan, the US, China and the United Kingdom.